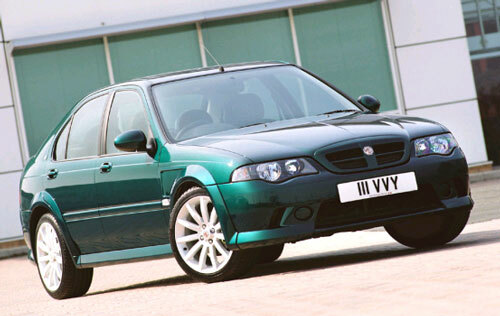 The MG Rover ZS range was created from the under rated Rover 45 range and unexpectedly the MG ZS180 was clearly the model that displayed the strongest MG characteristics or all the new MG saloons. This is why this model was chosen to be the base for the very competitive ZS race car that has been campaigned in the British Touring Car Championship with surprising success in view of the age and the low budget. Initially introduced in a base 120 versions using the well-proven 1.8 litre K series engine in 120Ps format, and a top of the range version using a 177Ps version of the 2.5 litre KV6 engine. Both models use a sports ratio PG1 gearbox, along with very significantly tweaked suspension and in the case of the ZS180 bigger discs and calipers all round. To provide for the increasing diesel market for all vehicles including sporting cars, the well-proven L series 2.0 litre diesel is an option in the range. This engine provides strong performance from it’s modest power of 101 and 113Ps formats but has competitive torque outputs of 240Nm or 260Nm. Finally those preferring a petrol engine but with reasonable economy can also find a 1.6 litre entry level 110 model with 110ps. The ZS is found in two body styles, a 4-door saloon and a 5-door hatchback. Perhaps one of the most significant MG features has been the very large rear (ironing board) spoiler that has been standard on all ZS180 saloons until the face lifted models were announced in April 2004. The facelift models that arrived at that date saw the large spoiler revert to the option list, but the look of the 180 model was massively improved by the adoption of a very smart integrated body kit that included front wing gill vents, in a style taken from the MG SV. The bodykit was standard on the 180 and an option on all other models except the 1.6 models and was very popular. The effect of the 2005 model years styling changes together with the body kit created a completely changed the visual aspect of the ZS. In addition a completely new fascia was introduced and together with the external changes completely changed the visual aspect of the car and lost the aged connection that dated the original MG ZS models to the original 1995 Rover 400. 4 cylinder 1598cc and 1796cc K series petrol engines with 110 and 120ps power outputs. KV6 2.5 litre V6 petrol engine delivering 177ps power output. 4 cylinder turbocharged and intercooled L series diesel engine delivering 101ps in base TD form and 113ps in the uprated 115 model. All engines were connected to a manual 5 speed gearbox with the 1.8 litre 120 model having the option of the ‘Stepspeed’ CVT transmission, with a manual option with 6 artificial stepped ratios. Economy 29 to 38mpg average for petrol 45 to 48mpg for the diesels.